Natural growth phenomena such as fractals are often simulated when procedurally generating landscape terrains for gaming. Instead of simulating such phenomena we explore if captures of bacteria and fungi exhibiting fractal growth can be used to generate a game terrain. Furthermore their real-time growth could be used to generate an evolving game terrain in real-time. 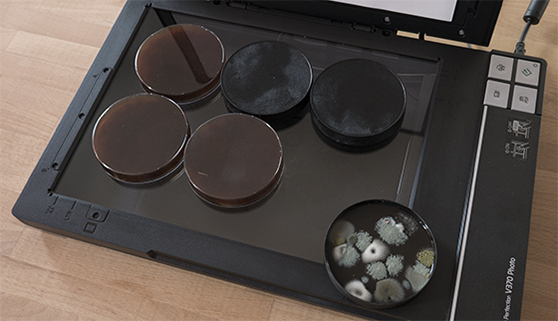 We grow our cultures in Petri-dishes on self-made dark colored agar, providing good visual contrast with the cultures. High-resolution captures of the cultures are made using a consumer flatbed scanner. The Petri-dishes are placed upside-down to avoid condensate build-up. The resulting scans are of sufficient resolution, free of artifacts, and evenly illuminated. To retain compatibility with current game creation workflows we use our captures as heightmaps. The direct mapping of grayscale values to terrain height results in sudden peaks on areas where the light of the scanner was reflected. This makes the terrain not easily accessible for ground-traveling in-game characters. To achieve a more accessible terrain, one could apply some form of postprocessing on the heightmap, effectively smoothing the terrain and thereby reducing terrain noise. Smoothing the heightmap using a low-width blurring filter gives suitable results, as the virtual analogy of naturally occurring erosion. Overall the appearance of terrains generated by our method looks natural. To a geologically untrained observer, they appear as possible results of geological processes. Natural growth of the organisms is indeed reflected in the change of terrains over time. Although not yet explored in this study, live interaction between player and organism could be a promising addition. A player could stimulate, delay or stop growth at a certain area using light, temperature, nutrition or toxics (e.g. alcohol or antibiotics). Such terrain-altering concepts could even be integrated into gameplay mechanisms. This research has been presented at 4th International Conference on Evolutionary and Biologically Inspired Music, Sound, Art and Design (EvoMUSART2015) on 8-10 April 2015 in Copenhagen (Denmark). More information about the article can be found here. Another example of a virtual landscape based on the growth of fungi and bacteria. The captures are directly used as heightmaps.